Create your own educational system with our learning solutions! 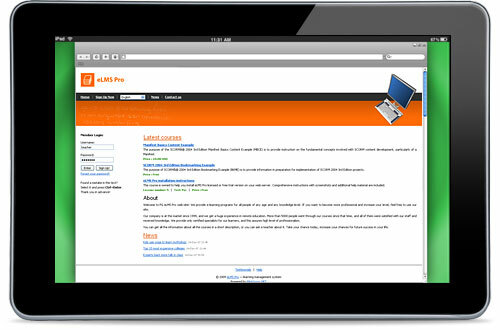 eLMS Pro Solution is an outstanding and yet simple Learning Management system. Our product is designed for any education formations: from small distance training companies up to big colleges and universities. The system allows to build courses, import SCORM content, deploy online leaning, manage users, communicate with users, track training results, and more. More information about eLMS Pro Solution is available. This information covers Overview, Features, Benefits, View demo or Download Free Trial, System requirements, Manuals. That would be useful for our company if you Tell Your Friend about us and our software. Online Training Solution is a powerful interactive multimedia software platform that uses the Internet to give students remote access to knowledge, immediate assessment of their assimilation, certification of achievement, and instructor and peer guidance as required. Students can register and learn at their own convenience, pace, and place or use Online Training Solution to supplement instructor-lead classes. More information about Online Training Solution is available. This information covers Overview, Features, Benefits, View demo or Free Download, System requirements, Manuals.